It began in the early 1940s. FDR had launched the New Deal’s collectivization of America, and a small but prescient group of libertarian and conservative intellectuals were in rebellion – such thinkers as Richard Weaver, Ludwig von Mises, Friedrich Hayek, John T. Flynn, Rose Wilder Lane, Isabel Paterson, and Ayn Rand, to be followed a decade later by the likes of Russell Kirk, Frank Meyer, and Murray Rothbard. Out of their cerebral and activist efforts there began the movement to repeal the overweening statism that was infiltrating America from Europe via Karl Marx and John Maynard Keynes. The infamous year of 1913 was the infiltration’s major manifestation. FDR’s New Deal was its Rubicon. In reaction to the radical political changes taking place during the 1913-1940 era, today’s freedom movement was born. It is not well-known by the general public, but when the modern freedom movement first began in the early 1940s, it was not split between libertarians and conservatives. It was one coalition unified in rebellion against FDR’s monster welfare state. By 1970, however, the movement had become tragically bifurcated. The radical economist Murray Rothbard took libertarians off into anarchy, while the traditionalist philosopher Russell Kirk drove conservatives into statism. This split has created two incomplete visions – contemporary libertarianism and conservatism – that are, in their singularity, incapable of effectively challenging the authoritarian mega-state. Conservatives are caught up in the puritanical swamps of legislating morality and hegemonic conquest of the world, while libertarians chase the philosophical absurdities of moral subjectivism and ersatz individualism. Conservatives wish to return to the Middle Ages and mandate morality via the state, while Libertarians wish to do away with any reference to morality altogether. Conservatives revere leaders like Savonarola and John Calvin. Libertarians excite themselves with Larry Flynt and the Beatles’ “Nowhere Man.” Somewhere the Founding Fathers are twisting in their graves over each of these political movements and their embarrassing lack of comprehension concerning the requisites for a free and individualist society. How do we confront this lack of comprehension? We must purge the libertarian and conservative movements of the fallacies they have adopted from Murray Rothbard and Russell Kirk. This will require a “rational theory of politics” that can bring together the two philosophical streams of John Locke and Edmund Burke so as to restore the original Republic of States that Jefferson and the Founders envisioned. More on this theory shortly. In the aftermath of LBJ’s defeat of the Goldwater forces in the 1964 election, most libertarians, under the influence of the pied piper Murray Rothbard, split off from the official path of the freedom movement and wandered into the utopian forest of some very radical political-philosophical principles – those of anarchism. In contrast, conservatives went the other direction by abandoning principle altogether to align themselves with Irving Kristol’s collectivist neo-conservatives and tolerate the very government usurpations their movement had been formed to repeal. They began their sellout when Richard Nixon declared in 1971 that, “We’re all Keynesians now.” They continued it with Ronald Reagan’s massive expansion of the welfare state and when George W. Bush launched a tide of spending, privilege, and corruption totally unhinged from sanity and reality. Can today’s freedom movement be rescued from this tragedy of default? Can the American people be convinced to restore the Republic? Yes, but in order for such a revolution to actually take place, American libertarians and conservatives must face up to some unsettling realities and take appropriate action. The conservative wing of the “freedom movement” has been grievously corrupted by Machiavellian statists. The most important cause of this has been Russell Kirk’s philosophical emphasis on tradition being transcendent to reason and his rejection of “equal individual rights” in favor of special privileges and a flexible Constitution. This has led conservatives into a Faustian bargain with the statist enemy and opened the door for the hijacking of their movement by neoconservatives, thus moving most of today’s conservatives to the left into lockstep with statist liberals. The libertarian wing of the “freedom movement” has been equally corrupted, but in the opposite direction to the far right on the spectrum. The most important cause of this has been Murray Rothbard’s anarchist politics that privatizes all functions of the government, even the military, police, and courts of law. In addition his followers espouse an egoistic “do your own thing” culture that refuses to morally condemn the traditional evils of history. Whatever is peaceful is their creed. It is a sense of life that worships what the Greeks called the sin of “eleutheromania,” freedom without limits. To better understand the nature of this disastrous split between libertarians and conservatives, a brief exposition of America’s concept of freedom is necessary. The American concept of freedom has its ideological roots in the Founders’ libertarian political ideal, combined with conservative metaphysics and culture. It is a blend of the 17th and 18th century thinkers, John Locke and Edmund Burke (one libertarian and the other conservative), which heavily influenced Americans from the start and up through World War I – the former emphasizing reason and individualism, the latter tradition and community. It manifested in what is called Jeffersonianism. This political philosophy stands for the individual over the collective, a strictly limited constitutional government based upon federalism, equal “rights” instead of equal “results,” a free-market economy, no entangling foreign alliances, and an objective code of morality for society as opposed to the moral neutrality of Rothbardians and modern liberals. This is what needs to be restored. 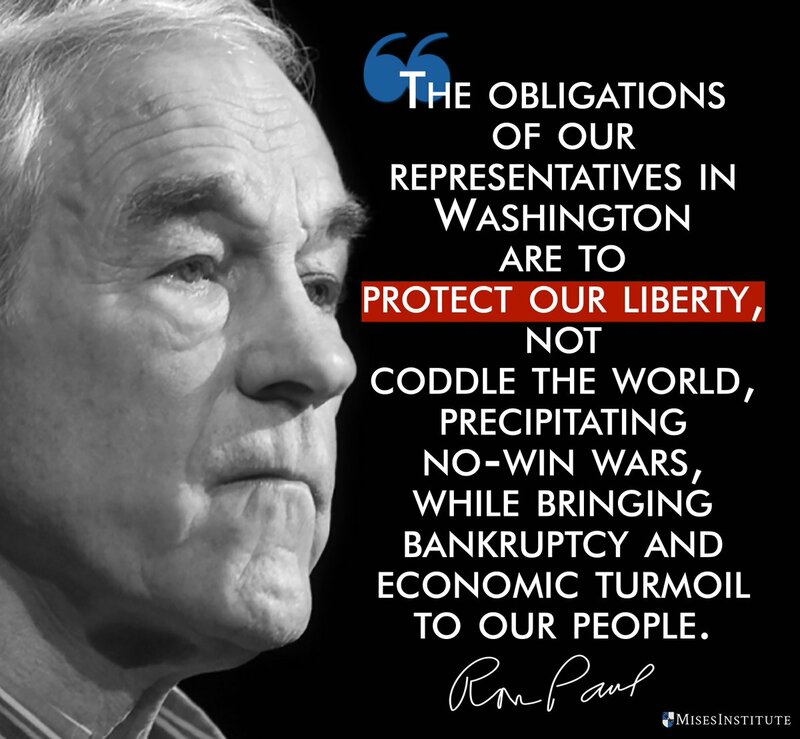 This is the crucial issue of our time – restoration of libertarian conservatism in America and its “settled code of freedom for the individual.” If we, who believe in free enterprise and the Constitution, wish to reverse America’s drift into an authoritarian state, our goal must not be to accommodate, but to purge the Gargantua on the Potomac that usurps our rights and freedoms with impunity. Libertarians and conservatives must be reunited to effectively challenge this monster. My book, The Golden Mean: Libertarian Politics, Conservative Values explains the need for this ideological unification and how to bring it about. I realize authors don’t usually promote their own books in their articles, but in defense of my lack of orthodoxy, I cite the popular economist, Walter Williams. Several years ago he was writing a review in his newspaper column for one of his own books. And in defense of his partisan effort, Professor Williams explained to his readers that his mother had always told him, “it’s a poor dog who won’t wag his own tail.” So if the reader will indulge me, I would like to partake in a little tail wagging. The Golden Mean is the philosophical answer to our immensely troubled times. It puts forth the “rational theory of politics” referred to earlier, and which we desperately need in order to challenge the authoritarian statism that has been destroying our republic ever since 1913. The libertarian movement is lost in “utopian unreality.” The conservative movement is lost in “statist appeasement.” This is because of the disastrous libertarian-conservative split spawned by Murray Rothbard and Russell Kirk back in the 1960s. Without a correction of this split, freedom cannot be adequately defended and restored. Both libertarian and conservative activists are terribly misguided in their insistence on remaining separate movements. Conservatism needs libertarian politics in order to be just, and libertarianism needs conservative moral values in order to be workable. It is important to keep in mind the difference between a Democracy and a Republic, as dissimilar forms of government. Understanding the difference is essential to comprehension of the fundamentals involved. It should be noted, in passing, that use of the word Democracy as meaning merely the popular type of government–that is, featuring genuinely free elections by the people periodically–is not helpful in discussing, as here, the difference between alternative and dissimilar forms of a popular government: a Democracy versus a Republic. This double meaning of Democracy–a popular-type government in general, as well as a specific form of popular government–needs to be made clear in any discussion, or writing, regarding this subject, for the sake of sound understanding. These two forms of government: Democracy and Republic, are not only dissimilar but antithetical, reflecting the sharp contrast between (a) The Majority Unlimited, in a Democracy, lacking any legal safeguard of the rights of The Individual and The Minority, and (b) The Majority Limited, in a Republic under a written Constitution safeguarding the rights of The Individual and The Minority; as we shall now see. In both the Direct type and the Representative type of Democracy, The Majority’s power is absolute and unlimited; its decisions are unappealable under the legal system established to give effect to this form of government. This opens the door to unlimited Tyranny-by-Majority. This was what The Framers of the United States Constitution meant in 1787, in debates in the Federal (framing) Convention, when they condemned the “excesses of democracy” and abuses under any Democracy of the unalienable rights of The Individual by The Majority. Examples were provided in the immediate post-1776 years by the legislatures of some of the States. In reaction against earlier royal tyranny, which had been exercised through oppressions by royal governors and judges of the new State governments, while the legislatures acted as if they were virtually omnipotent. There were no effective State Constitutions to limit the legislatures because most State governments were operating under mere Acts of their respective legislatures which were mislabeled “Constitutions.” Neither the governors not the courts of the offending States were able to exercise any substantial and effective restraining influence upon the legislatures in defense of The Individual’s unalienable rights, when violated by legislative infringements. (Connecticut and Rhode Island continued under their old Charters for many years.) It was not until 1780 that the first genuine Republic through constitutionally limited government, was adopted by Massachusetts–next New Hampshire in 1784, other States later. Democracy, as a form of government, is utterly repugnant to–is the very antithesis of–the traditional American system: that of a Republic, and its underlying philosophy, as expressed in essence in the Declaration of Independence with primary emphasis upon the people’s forming their government so as to permit them to possess only “just powers” (limited powers) in order to make and keep secure the God-given, unalienable rights of each and every Individual and therefore of all groups of Individuals.